This holiday season, it seems that Activision will be shilling plastic as if they were heavily invested in Oil Futures. DJ Hero is one of those games with a plastic toy, which comes in the form of a vinyl turntable and primitive mixer. But rest assured; it is worth finding a place in your cluttered closet to store DJ Hero, because it has turned out to be a challenging and fine rhythm game. This is the kind of music game many have dreamed about since the original Guitar Hero demonstrated the potential the genre had. 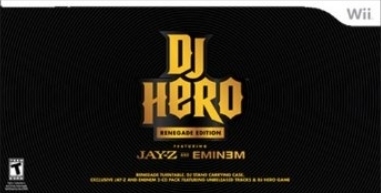 In DJ Hero, the player assumes the persona of concert or club DJ. It’s your job to play a setlist and keep the party going. As anyone who has been to a club can attest; musical selection is key to accomplishing this goal. So developer FreeStyle Games made sure this game had the most unique arsenal of music ever conceived in a licensed music game. 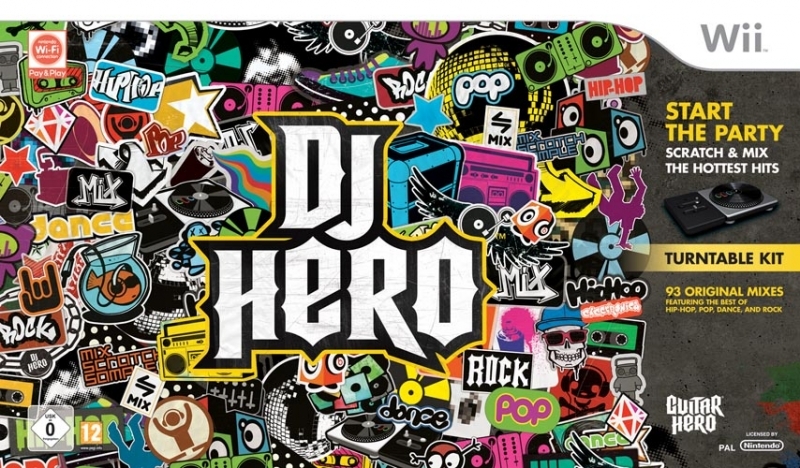 DJ Hero has about 102 licensed tracks that are mashed up to make 93 different mixes. The mash-ups are awesome, featuring mixtures that you would have never imagined (such as Gorillaz and Blondie). The dance beats are just as intoxicating as you would expect, with many being originals from the likes of Grandmaster Flash and Jay-Z. The training lessons are also very lovingly voiced by Grandmaster Flash himself – a nice touch for turntable fans. Unfortunately, this is where any of the developer's regard for the game's presentation ends. Everything else seems very bland by nature. The menus are utilitarian and only consist of a variety of faux album covers. When compared to rhythm games that have high presentation values, like Rock Band 2, the character animations fall shamefully flat. There are times when Activision even throws in a sensually dancing club patron that doesn’t flow well at all. Also, you never get that feeling that you are really the performer or consequential to the performance. Mistakes don’t get much of a crowd response and don’t translate as accurately in the music as they do in Rock Band. Sometimes, mistakes simply mute a track or cause a forgettable low static hum. There are no filters and overlays or strong crowd reaction to using Euphoria (Star Power). Euphoria also doesn’t have the same impactful sound changes that the Star Power of other music games has; the music’s volume isn’t raised as noticeably and the crowd doesn’t get as hyped. Many aspects of the presentation seem rushed in nature and could have used some more time in development. The gameplay, however, is spot-on, just like the music. It follows the now well-known Simon Says design. There are three colored lanes on the screen that match the three colored buttons on the turntable. Icons fall from the horizon to the strike zone, or metronome, at which point the player has to hit the correlating button or make the correct motion. The player’s other hand controls the slider, which has three positions: right, left, and center. When the blue track moves right, the slider must be moved right, when the green track moves left the slider is moved to the left position. When all tracks are in their normal position the slider should be centered. Using both sides of your brain in the frenetic action of a song is where all the fun comes from. This game forces you to juggle many balls in the air at once. One thing that sets the turntable above the typical guitar is its variety of input options. The guitar only requires correct button placement and a strum. The turntable and mixer demand a whole lot more. Button placement is still important and often times the only input needed is a simple button strike with no other motion. In addition, there are scratches, which require pushing a given button and then scratching. Scratching comes in different flavors, from a freestyle scratch to directional scratches. Also, you must manage the slider, which is always changing positions. Spikes are a quick single beat slide in one direction and back to center; they are insanely difficult. Spikes are a common occurrence in harder setlists. Additionally, there are periods where you can use the red button to create freestlye sound effects. The knob lets you choose between five different sound effects which can be used for a givien song; best of all, these sound effects can be customized by pre-selecting which ones you want to use before starting a setlist. You will know when to use freestyle sound effects when the red track becomes wider; when this happens, press the red button as you wish for to play your selected sound effect and earn some extra points. There are also point multipliers to manage while playing. There is a knob that can be used to change the pitch of a track at certain times for double scores. However, that particular option is marred by poor presentation, as the sound change is negligible. You can build a multiplier by going on mistake-free streaks; 4x is the highest you can achieve with this. Euphoria is built by being mistake-free when the highway and notes are glowing blue. Euphoria is deployed by pressing the glowing red button on the mixer and it doubles your built-up multiplier. The coolest point multiplier is the rewind. Obtaining a rewind is a trick; you have to deploy a Euphoria with a 4x multiplier. Once obtained, you use the rewind by spinning the turntable backwards full circle. 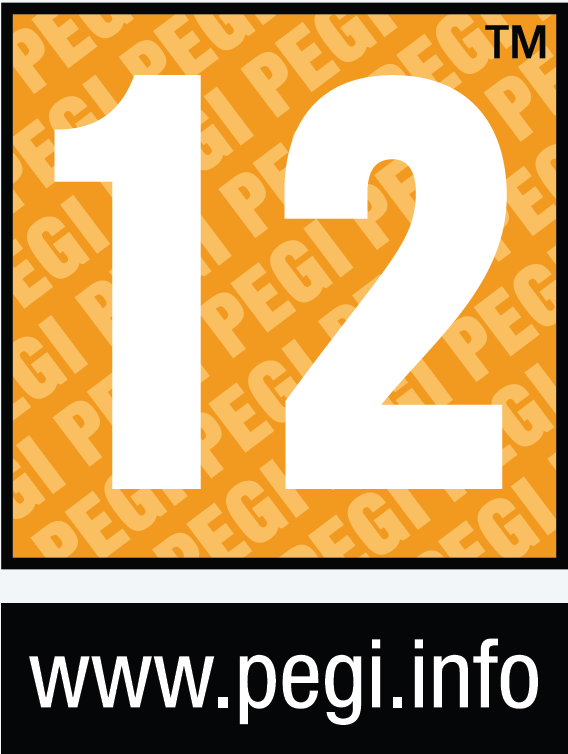 This allows you to replay a section with up to 16x point multiplier. As awesome as the gameplay is, it is unfortunately cut short. The game feels very barebones in some shocking ways; namely single player and multiplayer modes. There is no tour or need to build a fanbase, just a list of increasingly hard setlists to complete. It feels as though the game is built off a very long quickplay mode. There is no character creator, but you can unlock more DJs with earned stars (many are famous DJs). The Multiplayer suffers even more as it feels superfluous. When playing online there is no difference in experience and the second player might as well not exist. 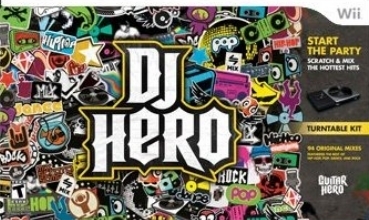 DJ Hero has no special online or local modes, such as Tug of War. Really, the game's only value extenders are the fact that you can play guitar with a second player, buy new songs online, and unlock a ton of content by earning stars. DJ Hero is the kind of rhythm game I've been wanting for a long time, and it does deliver on its gameplay potential. However, it is a mixed bag on both value and presentation, which stops it from being the complete experience I hoped for. No compelling single player or multiplayer modes is a crying shame, and some of the animation is uninspired. 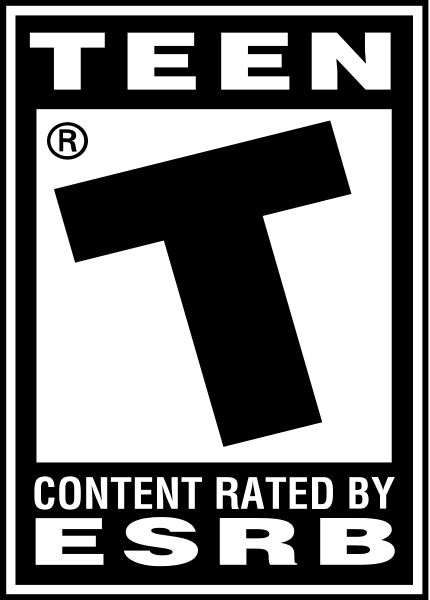 But stellar gameplay and unique use of hardware combine with the most innovative soundtrack in a game to create a fun game that you can pick up and play anytime. The price is kind of hard to swallow at $120 USD, especially with the skimpy features, but if you enjoy music games, then DJ Hero is a great addition to your collection.